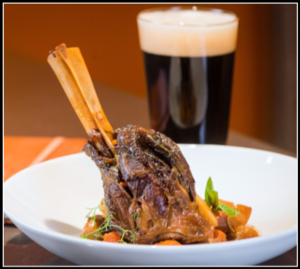 Image of Porter Braised Lamb Shank taken for the Beer Institute. Recipe was created by Chef Laurent Aubel. Heat olive oil in a large pot or Dutch oven over medium-high heat. Season lamb shanks with salt and pepper and then sear for 3 minutes or until brown on each side. Transfer shanks to a plate to rest. Add onion, carrots, celery, potatoes and sauté until golden brown, 8-10 minutes. Add in lamb shank and cover with porter and veal stock. Season with rosemary, thyme, and bay leaves. Cover with lid and places in oven for 3 hours at 320 degrees F. When the shank is ready remove them from the cooking juice put them in a tray, reduce the cooking juice until you obtain a thickened, gaze constancy. Before serving, remove bay leaves and thyme and rosemary stalks. Season with salt and pepper as desired.